READING: After reading ORPHAN TRAIN TO KANSAS, or another book or article on the orphan trains, test students' comprehension with a version of the game "20 Questions." Write the names of the people featured in the reading on individual slips of paper. Divide the class into two teams. A member of one team draws a name and "becomes" that person. Members of the other team ask questions that can be answered "yes" or "no" to discover the identity. Give teams one point for each questions asked and five points for an incorrect guess. At the end of each round (set a time limit, or decide how many questions can be asked), the team with the lowest score wins! SOCIAL STUDIES: The Orphan Train Era began prior to the Civil War and ended on the eve of the Great Depression, yet this mass migration of children is rarely mentioned in student textbooks. Have students create a time line from the mid-1800's to the mid-1900's showing what was going on in the country during the years that the orphan trains carried children throughout the nation. Some of the events that could be included on a time line are: westward migration on the Oregon Trail, the Pony Epress, presidential elections, Civil War battles, the sinking of the Titanic, World War I, Charles Lindbergh's transatlantic flight, the enactment of laws governing adoptions and regulating child labor, etc. Challenge students to add events from local, county, state, national, and world history to the time line every day. This could be an ongoing project! It will help students see how the pieces of history fit together. ART: Have students create photo collages or other illustrations using computer graphics to represent the experiences of orphan train riders. Choose an orphan train rider and create a drawing, painting or diorama that illustrates the changes he or she experienced when "Placed Out". DRAMA: Write and perform a play about an orphan train rider's experiences. You might want your play to depict the train ride itself. Most children who boarded orphan trains had never ridden on trains before. What would it have been like for them? Or, your play could depict the selection process where children were examined by prospective parents. Sometimes agents had children recite poems or sing. Find out what the selection process was like for riders, then act it out! Be creative - there is a lot of drama in the stories of orphan train riders. WIth careful research, this could turn into a History Day project! Describe the housing situation for Oliver and his family when they lived at 405 E. 19th Street in New York City. How does their home compare to yours? What was Oliver’s punishment for playing hooky from school? Do you think this was a just punishment? What were some of the rules that Oliver and the other children were required to follow when he lived at The Children’s Village Orphanage? How do these rules compare to the rules that your parents have for you? How did Oliver feel about being chosen to ride the orphan train to find a home? How do you think you would have felt in his situation? When the Orphan Train reached each town along the route west, how were the children placed with families? What could you have done to make yourself stand out and be chosen by a family? Did Oliver and Edward like the family that chose them in Bern, Kansas? What was their life like with Farmer Blauer and his wife? During the years that Oliver lived with the McCammon family, the story focuses on Oliver. What do you think happened to Edward when he rode the Orphan Train a second time and was placed with Farmer Gish? On July 4, 1913, Oliver jumped on the side of a moving train to run away from the McCammon’s farm. Does this seem like a brave thing to do? Does it seem foolish? Would you try this? The Orphan Train Movement began in 1854 and ended in 1929. For those 75 years, over 250,000 children rode the trains that took them to new homes in the west. Do you think that the Orphan Trains were a good idea or a bad idea? Why or why not? What other solutions might have been tried to address the problem of so many homeless, orphaned and abandoned children living on the streets of New York and other east coast cities? When Oliver was a grown man, what do you think he had to say about the Orphan Train? In his dream, Oliver remembers back to a time in Esbon when he and his friends were collecting crow heads for the 5 cents bounty money that they could earn for each one. When he insists on burying the bodies of the dead crows, his friends thought that it was a waste of time. What do you think? What does this show us about Oliver’s character? Before they arrive in Goodland to work the fields, the hobos and Oliver agree that no one will go to work for a farmer for less that $4.50 a day plus board. When Oliver agrees to work for Burt McColl for just $4.00 a day plus board, he breaks his promise to the hobos. Why did he do that? Is it ever okay to break a promise? When Burt McColl yells at his young brother Walt for not working hard enough, he compares him to Oliver who has callused hands from years of hard work. Why do you think Oliver finds this comparison so troubling? Working for John McColl, Oliver learns to build a sod house. Why were houses on the prairie made of sod? Discuss how to build one. Compare sod house living to what life is like in your house. When Oliver returns to the McCammon farm to begin his search for Edward, what troubling information does he learn about his brother’s time in Kansas? Where must he go to find Edward and how does he get there? Is this a journey that you could make, on your own as a teenager? When Oliver returns to NYC, he meets with Rev. Swan who takes him to the offices of the Children’s Aid Society. There Oliver learns where Edward is living and he boards a train to visit him. Rev. Swan’s parting words to Oliver are, “I hope what you find is what you’re looking for.” What do you think he meant by that? What kind of warning might he have been trying to impart? When Oliver learns of Edward’s criminal acts, what is his reaction? Do you think his reaction was the right one? How else could he have reacted? Having had the same start in life, and traveled west on the same orphan train, why do you think Oliver and Edward came to live such different lives? After reading Orphan Train To Kansas and the epilog of Oliver’s life, give examples of how he lived by the motto, “Nothing ventured, nothing gained.” What do you think of this motto? What motto would you like to live your life by? 1. Since we cannot tell from reading Orphan Train To Kansas, just what happens to Edward while living at the Gish farm, write a missing chapter to tell the readers about life at the Gish farm for the years that Edward and Oliver were apart. 2. Children of the orphan trains were not able to write letters directly to family or friends without first having the letter sent to the Children’s Aid Society for approval to be sent on to the addressee. Letters were found in the CAS archives that Oliver and Edward wrote to one another which were never forwarded, thus keeping the brothers in the dark about what was happening in one another’s lives. Imagine that you are Oliver living on the McCammon farm and write a letter to your brother Edward. Or, imagine that you are Edward and write to Oliver. 3. Write a poem or Haiku about Oliver and Edward or about the Orphan Train Movement. 4. Choose ten words that are relevant to Orphan Train To Kansas and build a word search puzzle. Trade puzzles with a classmate and try to solve. 5. Draw a picture to illustrate your favorite scene from the book. 6. Create a ten question, multiple choice Quiz on the book. Can your classmates pass the test? 7. With several classmates, write a short skit about a scene from the book. Ideas could include... 1. What it was like to line up on the Opera House Stage to try to find a family to live with… 2. Oliver and Edward discovering baby chicks… 3. Leaving school and getting lost in a snowstorm… 4. Oliver’s experience in the Powerhouse Jail… 5. Building a sod house… 6. Meeting Estella on the train to Elmira… etc. Take turns performing your skits for the class. 8. There are no surviving adult photographs of Edward. Draw a picture of what you think he looked like. 9. Create an original cover, front and back, for Orphan Train To Kansas. 10. On a map of the United States, locate NYC and Bern, Kansas. Draw the route between the two locations and determine the distance in miles. Oliver's trip took three days. How many miles did he travel each day? Looking at a topographic map of the U.S., discuss what Oliver and Edward might have seen when looking out the train window as they traveled through each state. Oliver blamed himself for Estella’s death, saying that he should never have let her take that job. Was his self blame justified? Why or why not? Why do you think that some of the foster homes proved to be unloving and harsh environments for the children? What hardships did the boys have compared to your life? What freedoms did they have? Why did Oliver allow his boys to run wild and unsupervised? Discuss the “adventures and pranks” of the Nordmark brothers. Do you think it was all just “fun” or was their behavior a problem? Is stealing coal justified if your family has no heat? When Oliver found work and was able to take his children back to live with him, he only brought the four boys to the house on Brushy Mountain, leaving the girls with the Kemmerers. Why do you think he did this? How do you think the girls felt about it? How about the boys? Why do you think that Oliver turned his four youngest children over to the Children’s Aid Society a second time? Why did he choose to tell them in a letter? Why did the author choose to end the story with Benny’s first day at the Wicks’ farm? How do you think the author decided on the title for the book? What does it mean? Is there more than one meaning that you can think of? 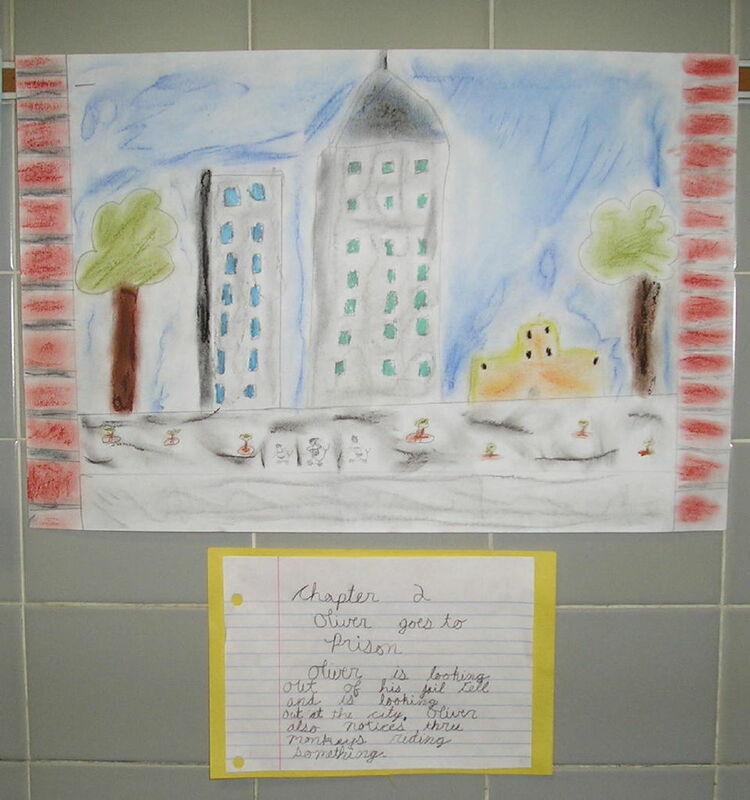 Choose a chapter from the book and draw a colored chalk illustration with a brief summary of the chapter below. Write a poem or Haiku about the Great Depression. Choose ten words that are relevant to the Great Depression and/or the story Peanut Butter For Cupcakes and build a Word Search puzzle. Trade puzzles with a classmate and try to solve. Chapter 8, The Kobers & The Kemmerers, focuses mainly on life at the Kobers. Write a missing chapter, Chapter 8 ½, that tells the reader about Margaret and May while living at the Kemmerers as you imagine it must have been. Choose a scene from the book and write a skit about it. Take turns performing for the class. Ideas include, 1. Estella’s two days of work at the Indian Queen Hotel… 2. Oliver’s children playing “funeral” in the backyard… 3. Bud and Oliver Jr. being removed from the home to ride the train to the Mont Alto Sanatorium… 4. May protecting her siblings against an unknown stranger at the front door…etc. Several historical programs and institutions are a part of the book. Choose one of the following and research it further in a report to be shared with the class. WPA (Works Progress Administration), CCC (Civilian Conservation Corp), CAS (Children’s Aid Society), MONT ALTO Sanatorium, Mont Alto, PA, THE 1939 WORLD’S FAIR in NYC. Create a ten question, multiple choice QUIZ about the book. Can your classmates pass the test? Create an original cover, front and back, for Peanut Butter For Cupcakes. Oliver chose to tell his four youngest children in a letter that he was turning them over to the care of the Children’s Aid Society. Imagine that you are either Margaret, Oliver Jr., Jim or Benny and write a letter back to Oliver about your thoughts and feelings at this time. People who lived through the Great Depression are now in their 80’s. Interview someone who lived through this very difficult time in United States History to get their impressions. Be sure to ask how their experiences influenced who they became as adults and how they lived their life.